On June 16 Deacon David Ousley, 61, a former Episcopalian and Anglican priest, drew to completion a very long journey when during a Mass at Philadelphia’s Holy Cross Church he was ordained to the Roman Catholic priesthood by Bishop John J. McIntyre. Henceforth he will pastor his now-small congregation of St. Michael the Archangel Parish, which currently worships every Sunday with Mass at Holy Cross, at the invitation of Holy Cross’ pastor, Father James Cox. Just as two millennia ago Julius Caesar’s life and Rome were forever changed when he made his fateful decision to return to Rome, so the lives of Father Ousley and others “returning to Rome” and the Catholic Church are forever impacted, and so may the life of the Church itself. For Father Ousley, who was raised in rural Massachusetts, becoming Catholic is not something he would have dreamed possible in his youth. Boston was Catholic, his area was Protestant and Republican. “Catholics were Democrats and other unspeakable things,” he said. Jack Kennedy was running for president, and there were the old biases. Would he answer only to the Pope if he were elected? Then too, there was a matter of a grand old house on spacious grounds in the town that went up for sale. The elderly seller presumed the new owners would preserve and cherish it just as she had. It turned out the purchaser was a straw buyer for the Archdiocese of Boston, which promptly had the housed razed to build a Catholic Church. It did nothing to help ecumenical relations in the town. Father Ousley’s conversion from the Methodism of his birth to Episcopalianism came while he was a student at Yale. “I discovered the liturgy of the Episcopal Church and it struck a chord,” he said of his conversion to that faith. It made sense to him. Episcopalianism, as part of the Anglican Communion, was part of the much needed Church reform in the 16th century. He believed the Anglicans, unlike the reformers on the European continent, preserved the best parts of Catholicism while eliminating those parts that needed change. He was ordained an Episcopalian deacon and priest in 1979, but was already having some misgivings about changes the Episcopal Church was undergoing; and especially troubled by changed positions on such matters as homosexuality, abortion and women’s ordination. He left the Episcopal Church for the related but more conservative Anglican Church in America in 1999, but still felt he and others like himself were fighting a rear guard action in preserving the faith as they understood it. As an Anglican, he was pastor of a small flock, drawn from his former parish, St. James the Less, but rechristened St. Michael of the Saints with worship services in the chapel of West Laurel Hill Cemetery. The Catholic reforms of Vatican II were really the events that started him on the road to Rome. “It did away with many of the reasons for schism, and provoked many of us to consider our position versus the Catholic Church and conclude we should no longer be outside of it,” he said. Ultimately, it was the landmark apostolic constitution Anglicanorum Coetibus (Groups of Anglicans) issued by Pope Benedict XVI in October 2009 that tipped Father Ousley fully toward the Catholic Church. The document provides a path to Catholicism for members of the Anglican Communion who wish to become Catholic while retaining cherished traditions that do not conflict with Catholic teaching. 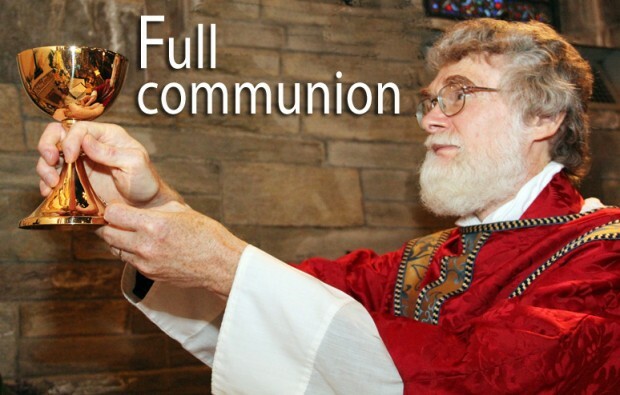 On Jan. 1, 2012, the Personal Ordinariate of the Chair of St. Peter was established for former Anglicans in the United States and Canada, with Msgr. Jeffrey N. Steenson, who is based in Houston, Texas, as the ordinary. Although Msgr. Steenson is a former Anglican bishop and could not be ordained a Catholic bishop because he is married, he nevertheless within his ordinariate performs many of the same functions as a bishop other than ordinations and he is a participating member of the United States Conference of Catholic Bishops. While the members of St. Michael the Archangel worship in Philadelphia, they are not under the jurisdiction of the Archbishop of Philadelphia but of Msgr. Steenson. It was on April 2, Monday of Holy Week, that Father Ousley and those of his flock who wished to take this final step were formally received into the Church, with Father Scott Hurd, vicar general for the ordinariate coming up from Washington to preside at the ceremony which was held at Holy Cross Church in Philadelphia’s Mount Airy section. As part of the process, the congregation had undergone a study of Catholic teaching, especially how it differed from Anglican beliefs, for example the primacy of the Pope and the doctrines of the Immaculate Conception and the Assumption of Mary, which in Anglicanism were voluntary pious beliefs but not dogma. For Father Ousley, there was a preliminary step before Catholic priesthood. On May 12, at St. Charles Borromeo Seminary he and Philadelphia seminarians Sean Loomis, John P. Stokely and Thomas Vivian were ordained transitional deacons. As a nice touch his three brother deacons, who will not be ordained to the priesthood until next year, attended his June 16 priestly ordination. Like most priests who have converted from Anglicanism Father Ousley is married. His wife Elizabeth also became Catholic as well as his mother, Nancy and his three children James Michael, a Marine officer; Elizabeth, a ballet dancer and Jonathan, who is in college. During his ordination, it was Father Ousley’s privilege to receive his older son into the Church and administer the sacrament of confirmation to him. Although liturgies at St. Michael of the Archangel include many elements of traditional Anglican worship service they are valid Catholic Masses and those who were born into Catholicism may attend, but they cannot become members of the congregation. On the other hand converts from Anglicanism are free to join a traditional Catholic congregation if they so choose, but as Father Ousley notes they may be more comfortable at a personal ordinariate church such as his. Certainly the liturgies do retain aspects of Anglican worship services, but the differences are less than they would have been pre-Vatican II, when Catholic liturgies were mostly in Latin, something Anglican liturgies never were. The main difference may be more subtle. Most Anglican congregations, as is the case with many mainstream Protestant congregations, tend to be much smaller than the typical Catholic parishes, with a more intimate feel of everyone knowing everyone, Father Ousley noted.